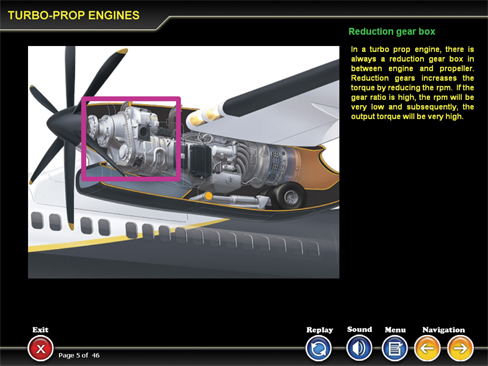 EASA 66 Module 15 is a comprehensive CBT that details the Gas Turbine Engines from the fundamentals, the care and maintenance, all the way to storage and preservation. Gas Turbine Engine construction and all sections of turbine engines are also presented in great detail. Constructional arrangement and operation of turbojet, turbofan, turboshaft, turboprop. Engine ratings, static thrust, influence of speed,altitude and hot climate, flat rating, limitations. sealing and external air services. Configuration of firewalls, cowlings, acoustic panels, engine mounts, anti-vibration mounts, hoses, pipes, feeders, connectors, wiring looms, control cables and rods, lifting points and drains.